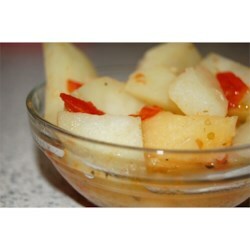 "Diced potatoes stewed with onions, garlic, tomatoes, and rutabaga in broth. Chicken, beef, or vegetable broth may be used." Heat the oil in a skillet over medium heat, and saute the garlic and onion until tender. Stir in the tomato, and cook until heated through. Mix in potatoes and rutabaga. Season with oregano, salt, and pepper. Pour in the broth, and bring to a boil. Reduce heat to low, and continue cooking 15 minutes, or until potatoes and rutabaga are tender. Very salty boiling water is the key to these flavorful baby potatoes.